← Poll: What is your favorite rendition of the New Africa Twin? New puzzle piece gives us an idea of what could be next from Yamaha in the Adventure world. An illustration (source: CycleWorld via Young Magazine in Japan) of a sport/touring Yamaha has been leaked to the press. You could call it an adventure-styled motorcycle. It appears to have been “photoshopped” around the MT-09 (FZ-09) triple motor and frame and denotes a definite street orientation, but with an adventure flavor to it. Imagine saddle bags and a different screen and it will look more the part. Certainly this handsome concept is street looking enough to not be associated with the Ténéré genealogy. We believe a real mid-size Ténéré, if it is forthcoming, will probably have a 21 inch front wheel, more suspension travel, spoked wheels, and a different more upright windscreen. However, this bike fits our earlier prediction that Yamaha could bring to the market two adventure styled motorcycles: a street oriented version that could be based on the triple motor; and a dirt-oriented version that could be based on the parallel twin motor. 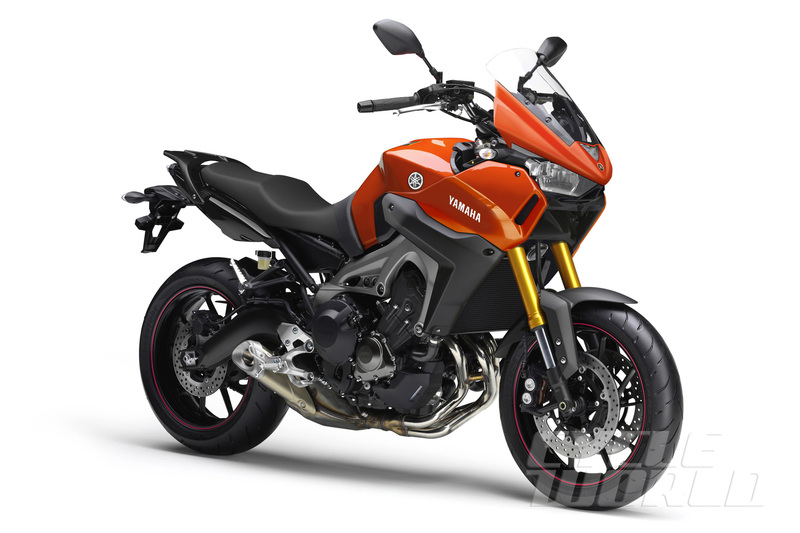 We were expecting the street version of a new Yamaha adventure bike to come fitted with a 19 inch wheel. Instead, whoever included a 17 inch front wheel in the drawing above places this bike in another pack of bikes, perhaps as an affordable version to the Multistrada or the speculated touring styled version of the BMW S1000R. Or you could see it as a good upscale version of Honda’s CB500X and NC750X. Such a Yamaha bike would be right in the middle of this gradient of 17 inch front wheel adventure-tourers. This is a growing segment, it seems – adventure styled street bikes with a touch of sport that are great in urban settings and good enough for touring. The larger bikes of this group could definitely be called sport/touring adventure-styled bikes. Anyway, this sport/touring adventure-styled drawing could actually be similar to one of the 15 motorcycles Yamaha is claimed to be launching at the upcoming motorcycle shows this year (Intermot in early October in Cologne and EICMA in early November in Milan). We still believe Yamaha will bring to the market, besides an MT-09-based adventure/sport/touring bike, a mid-size Ténéré based on the MT-07/FZ-07 platform, a real adventure bike, with dirt orientation to take over the aging 660 XTZ. Overall, it could be based on the concept depicted in this illustration, although it looks way too urban to us. Perhaps imagine a narrower bike, with a 21 inch front wheel, a more upright screen, and an overall more rugged look. That would do it. But for now this concept gives inspiration for what could be coming soon from Yamaha and what a dirty version of this concept, based on the parallel twin, could look like. Fingers crossed. This entry was posted in Bike Reviews and tagged mid-size Ténéré, new Ténéré, Yamaha, Yamaha mid-size adventure bike. Bookmark the permalink. 4 Responses to New Adventure-styled Yamaha based on MT-09/FZ-09? Now that you mention it, the windshield does look a little too YZF-ish. Aside from that, it’s a great looking bike and since it’s based on the FZ-09, it’s sure to be a fun ride. I’ve ridden the Kawasaki Versys, which has 17″ wheels and is a very street-oriented adventure-ish bike, and it’s a blast around the city and in twisties. So nimble compared to other bikes in the segment like the Suzuki Vstrom. When I test-rode the FANTASTIC FZ-07, my first thoughts were “this is the perfect starting place to design a new Tenere”. I can’t wait to see what Yamaha will launch in October! The windshield makes me think it is not a final or Yamaha official design, at the most a concept of sorts. 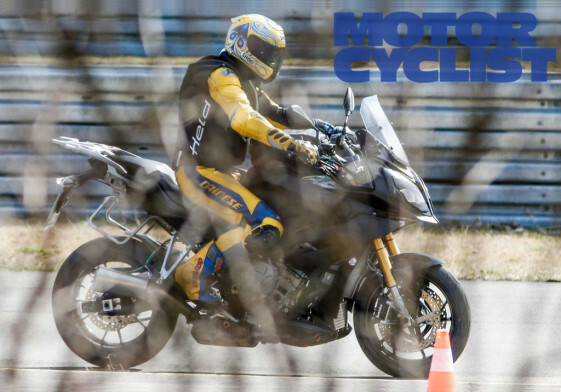 And let’s hope for a FZ-07-based Ténéré! Well, it uses the same motor, with some variations. Anyway, the final product is different than the one displayed here.